As a designer and dressmaker, builder and painter for theatre, ballet and contemporary dance, Lindy’s work has been seen widely across Canada, United States and Europe through performance, video and film. Her work, particularly as a costume designer, emphasizes an organic approach both in evolution and construction resulting in costumes with an intrinsic individuality. The current focus is on producing a series of fabricated sculptures with each individual piece averaging from 3 to 5 months from beginning to completion. Emerging from her theatre years, invention, construction and artistry combine to form a unique and distinct art form. 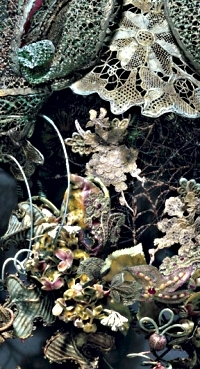 The sculptures in the series exhibit an intricate grouping and layering of fabrics and adornments as seen in elaborate period costumes and headdresses but this technique is now presented in a pictorial way, with special emphasis on materials, trims and objects of antique or sentimental value. The translation of colour, shape, texture and composition to portray mood is key. The first few pieces present as stage-like settings in a soft quilting-type manner. The others following become more “sprung”, wired, with parts moving and waving when provoked – little scenes to evoke thought and emotion; theatre reflecting life. Each piece of the series is an expression of inner landscape, challenged at every step by both the restrictive properties of the medium and by its unlimited possibilities. Commitment is made to always do something new both creatively and technically; to work against the obvious, with each piece evolving from the one before. The artist is challenged at every step to push forward relentlessly – even when it seems nothing new will happen – to strive until it does. Accompanying the wall hangings, large theatrical panels are in production, rendered as high resolution ink jet prints on stretched canvas. These panels serve to display a pronounced detail of the sculptures, magnifying intricacy, demonstrating the beauty of every fiber, every drop of paint, every shimmer and shadow…all giving the impression of infinite potential, worlds within worlds… illuminating a sense of mystery and discovery. This series, exuding strength of spirit, strength of character, by virtue of its delicate and gentle nature, draws from archetypal imagery and inspiration displayed in a dramatic setting. Although dreamlike and fantasy oriented, the settings are earthbound, connected to nature. The pieces demonstrate a timeless quality with shapes which ignite the memory and feed the imagination. With this series, folklore, myth and theatre merge as evidence of this artist’s love for life with its boundless value and possibility. These sculptures are executed with ingenuity, each piece assembled with inventive engineering to create a work of physical strength and visual intrigue. Themes are interwoven throughout as a multi- stranded braid, focusing on the beauty and delicate balance of nature. Viewers receive with delight and are compelled to study and piece together the puzzles of shapes and content to find the stories encased within.